Blog - You Can Own History @ Melt + 3.5%! You Can Own History @ Melt + 3.5%! If you’re looking to pick up some gold – or want a great value on a fascinating collectible – these stand out as the best buy! Traditionally, pre-1933 U.S. gold coins have carried a premium over modern-issue bullion products. That is, for many years, one would typically pay much more for a vintage coin vs a new Eagle or Maple. Nowadays, the roles have been reversed. You can get all the benefits thatvintage gold coins have to offer – at a lower premium than a modern bullion piece! Secondly, vintage gold coins have premium upside. In quiet markets like today, savvy investors can pick up pre-1933 U.S. gold at a modest amount over melt. During periods of short supply or increased volatility, however, these same coins can trade for significantly larger premiums. Within the past several years, vintage gold premiums have been 2x-5x where they are today. Thirdly, classic American gold coins are a true pleasure to hold and study. They are tangible relics of U.S. history. Few coins can match their fascinating historical backstory or numismatic allure. If you’re going to buy gold anyway, why not have fun at the same time? $5 Liberty Half Eagle, Extremely Fine (XF) or better: Just melt + $34.99. That’s just 9.25% over spot! $10 Liberty Eagle, Extremely Fine (XF) or better: Just melt + $34.99. That’s just 5.5% over spot! $20 Liberty Double Eagle, Extremely Fine (XF) or better: Just melt + $44.99. That’s just 3.5% over spot! All these coins are in Extremely Fine condition, meaning they show just light wear. The surfaces are problem-free and extremely pleasing. They look like they were just plucked out of circulation a century ago! As mentioned earlier, pre-1933 U.S. gold coins exist in finite quantities – and our stock is no exception. We have a limited number of these coins available at today’s special premiums. 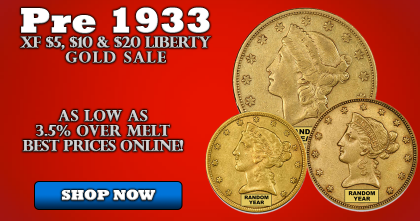 Don’t delay and pounce on this opportunity to own vintage American gold at a steal of a price.